ACMAR International Sdn Bhd is optimistic of selling two residential blocks at its D'Rapport @ Ampang project in Kuala Lumpur for RM640 million by the third quarter this year. The Klang-based developer's confidence is boosted by enquiries from serious buyers in Saudi Arabia, Iran, Pakistan and Korea, group managing director Datuk Steven Tee said. D'Rapport is designed specifically to cater to expatriates and participants of Malaysia My Second Home programme. It will be developed on 25ha of leasehold land, next to the South Korean Embassy along Jalan Nipah, off Jalan Ampang, in two phases. The first phase, called Festa and worth RM1.6 billion, is scheduled to complete by December 2010. It will comprise five 38-storey condominium blocks offering 1,099 units with built-up sizes ranging between 1,100 sq ft and 2,230 sq ft.
Tee said two blocks are open for en bloc buyers. The rest are for individual purchasers. Since the sales launch four months ago, 200 units worth RM250 million have been snapped up by buyers from Korea, Singapore, the Middle East and Malaysia, Tee said. "We hope to achieve 100 per cent sales by December, recognised instantly as we bill," he said. The Festa units are pegged from RM900 per sq ft or RM880,000 each to RM1.98 million. Penthouses, with built-up of 4,496 sq ft, are worth around RM5.2 million. Perspektif Masa Sdn Bhd, a unit of Acmar, yesterday appointed Asian Finance Bank Bhd (AFB) as the global property distribution agent for D'Rapport, and end financier for prospective buyers. AFB will market the condominiums in South Korea, Iran and the Middle East. Chief executive officer Datuk Mohamed Azahari Kamil said despite the difficult economic times, the bank, in its effort to stimulate growth in Islamic financial products, will continue to lend. "This venture to promote luxurious condominiums to the Korean and the Middle Eastern markets via our home financing should be perceived as the initial step towards promoting Islamic finance to the Koreans for financing their property in Malaysia," he said. An agreement was also inked with Sabah Development Bank Bhd, which will extend RM601 million in credit facilities to Acmar, to build the five blocks. Acmar will appoint by next month, contractors from Korea and China for the superstructure work. 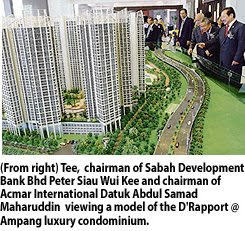 KUALA LUMPUR: Perspektif Masa Sdn Bhd, a unit of Acmar International, has secured a RM601mil loan from Sabah Development Bank Bhd (SDB) to finance the development of its RM1.5bil D’Rapport luxury condominiums in Ampang here. Acmar International group managing director Datuk Steven Tee said the company was set to launch the first phase of the project in the next four months due to a good take-up rate of 30% during the development’s preview in recent months. The condo units’ current buyers are from Singapore, Middle East and South Korea, he added. To encourage higher take-up rates from South Korea, Acmar International has invested approximately RM2mil in a new customer service and sales centre in Seoul, Tee said. Acmar International chairman Datuk Abdul Samad Maharuddin said property prices in Kuala Lumpur remained competitive compared to overseas prices. The project, jointly undertaken with Permodalan Negeri Selangor Bhd, consists of five 38-storey blocks comprising a total of 1,099 units and a gross development value of RM1.5bil. Perspektif Masa also signed an agreement to appoint Asian Finance Bank Bhd (AFB) as D’Rapport’s global property distribution agent and end financier. Covering 65 acres of land along Jalan Ampang, the project, also known as Festa, will be completed by 2011. D’Rapport’s penthouses are priced from RM5.17mil while the suites range from RM880,000 to RM1.98mil. HUA Yang Bhd, which plans to launch a project in Sungai Besi with gross development value (GDV) of RM700 million, is still confident about the property market despite slowing economic growth. Its chief operating officer, Ho Wen Yan, told Bernama in Kuala Lumpur today the company was not badly affected as other developers as it mainly targeted first-time home buyers rather than property investors. He said the company would continue to look for potential land in Selangor, Johor, Perak and Penang. "Hua Yang is interested to acquire landbank of between 60 and 120 hectares on the outskirts of Klang Valley, especially in Selayang and Rawang," he said. Ho said the company currently has a landbank of 400ha nationwide with a potential GDV of RM1.8 billion. Meanwhile, in a statement in Kuala Lumpur today, Hua Yang said its wholly-owned unit, Agro-Mod Industries Sdn Bhd, has signed a deal with Tesco to open an outlet in the Bandar Universiti Seri Iskandar township in Perak. It said the outlet would benefit the residents, especially university students in the township, as it would be a one-stop destination for their everyday needs. Hua Yang said the township was first developed in 1999 with a GDV of RM616 million to cater to the growing university student population of Perak. "It is strategically located within the education park which consists of higher educational institutions such as Universiti Teknologi Mara and Universiti Teknologi Petronas," it said. KUALA LUMPUR: Kenanga Investment Bank Research prefers innovative township developers like SP Setia and Mah Sing Group whose attractive packaging is more effective than the tax relief announced under the RM60 billion stimulus package. It said on March 12 the 5/95 deferred payment scheme, offered by SP Setia and Mah Sing Group, was more of a shot in the arm for the sector as it addressed affordability issues. “Developers bearing interest cost over the construction period saves relatively more than the tax relief. Consequently, SP Setia chalked up RM300 million sales in less than two months under the 5/95 programme,” it said. Kenanga Research has a buy call on SP Setia with a target price of RM4.25 and a buy call on Mah Sing at a target price of RM1.96. The tax relief announced on March 10 is only applicable to new home buyers. The tax relief would only be applicable for new sales and purchase agreements (SPA) signed on March 10 this year to end-2010. Kenanga Research said the tax relief incentive was unlikely to boost property transactions amidst economic uncertainties, particularly when the incentive is only valid for new transactions for less than two years. “As it is, potential home buyers are adopting the ‘wait and see’ strategy (for example those facing retrenchment or job uncertainties),” it said. Queensland and New South Wales governments give A$16,000 grant for first time home purchasers in their respective states; equivalent to 5.5% of an average house price of A$290,000. The research house said would be more effective to boost property transactions. If the grant substantially subsidises the initial down payment (ranging 5% to 20% of selling price), it will spur more property transactions; especially properties become more affordable.